A few weeks ago, my colleague, Michael, had a business lunch near our Center City school. 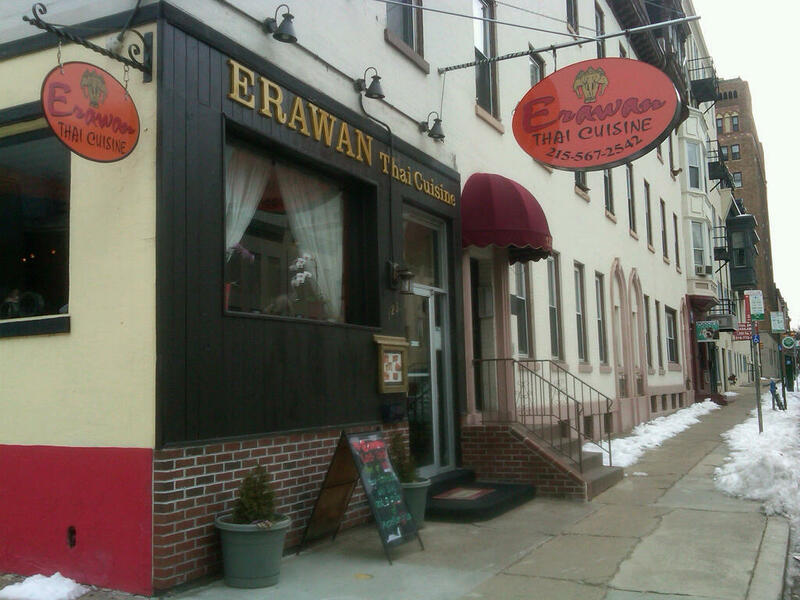 He came back and excitedly shared the news that Erawan Thai, just a few blocks from us, has a great lunch deal. For $7.95 per person, you get a salad, soup or appetizer and entree (upon checking their website, there is a similar dinner deal for $15.95.) We decided that we had to check it out one day. This week was jam-packed and seemed eternal, especially with an awesome conference we hosted over the weekend. By Friday, everyone was exhausted and VERY ready for the weekend. Michael and I decided to check out Erawan together for a mix of relaxation and business. We walked a few short blocks over to 23rd and Sansom, across the street from Greenfield Elementary School. The outside of the place was cute. When we stepped inside, the place was packed with people taking advantage of the special. There were a few large groups–this seemed to be a go-to spot for quick and inexpensive business lunches. We were seated quickly and I checked out the options for the lunch special. 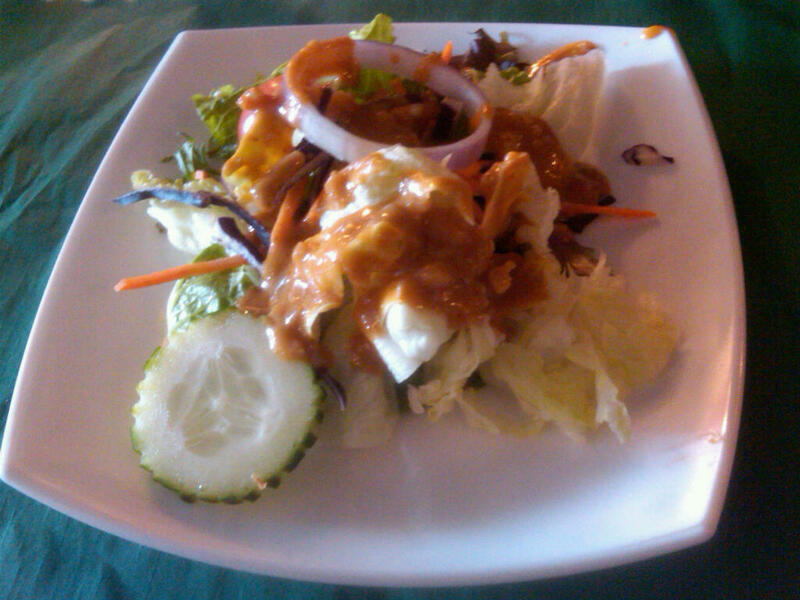 The salad included the “Erawan salad” with peanut dressing or “Thai garden salad” with creamy Thai dressing (whatever that entails.) Say peanuts and I’m sold. Michael and I both went with the Erawan salad. The salad came quickly and was a pretty unassuming plate of iceberg lettuce, cucumber, unripe cherry tomatoes, onion and shredded carrots and radicchio. Let’s talk dressing though. The peanut dressing was the bomb! Rich and nutty with chunks of crunchy peanut. That’s my kind of dressing. The appetizer options were fried spring rolls, fried chicken curry dumplings, chicken dumplings, pork dumplings, veggie dumplings, fish cakes of golden tofu (any guesses on what that might be–I’m guessing fried tofu.) We both went with dumpling–he got chicken curry and I opted for veggie. The veggie are below. The dumplings were fine. 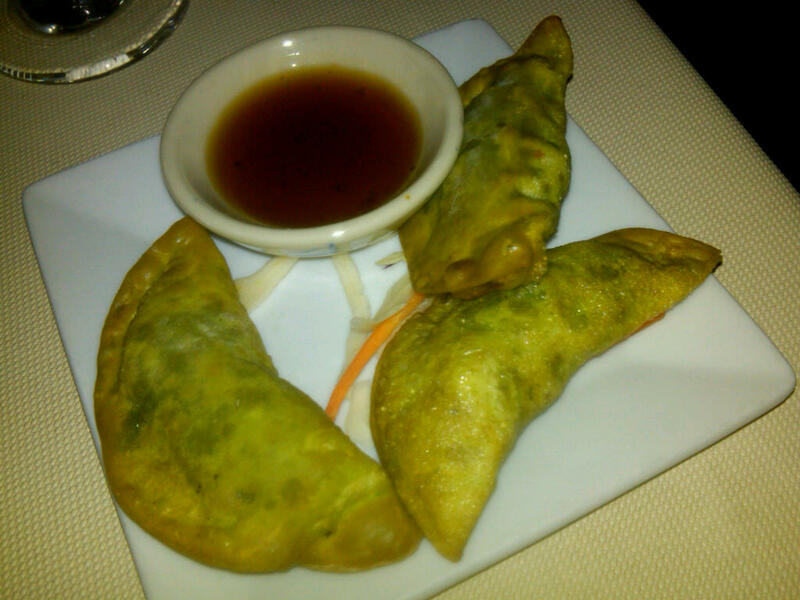 They were pretty skimpy on the filling but the ingredients were fresh and green (even the dumpling wrapper!) I didn’t grab a shot of Michael’s, but he seemed to enjoy them. Our entrees, like everything else, came out quickly. There was a long list of entrees to pick from and I was torn between noodles and a red curry. 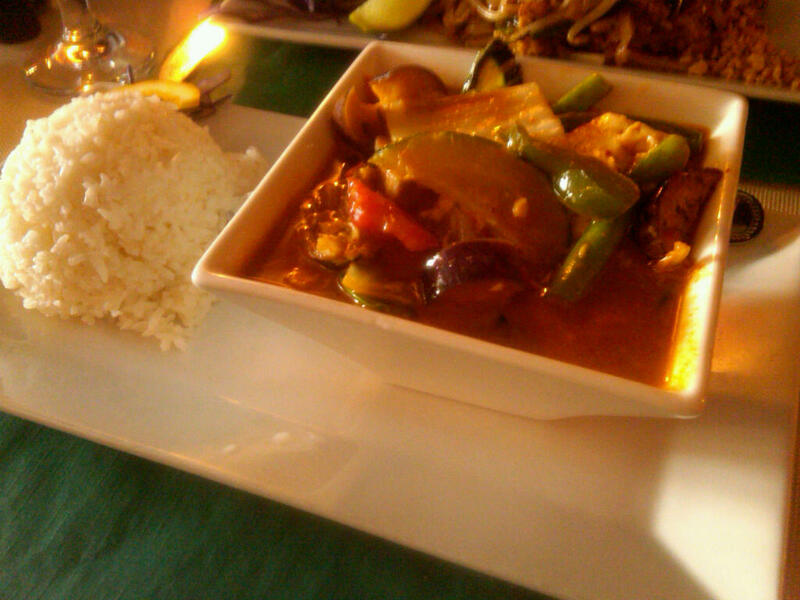 I usually get awesome noodles from Circles Thai, so I figured I’d opt for the red curry that I love but rarely order. Michael went with the traditional pad thai. As soon as the waiter walked away, I started to have order regret. It continued when the entrees arrived. 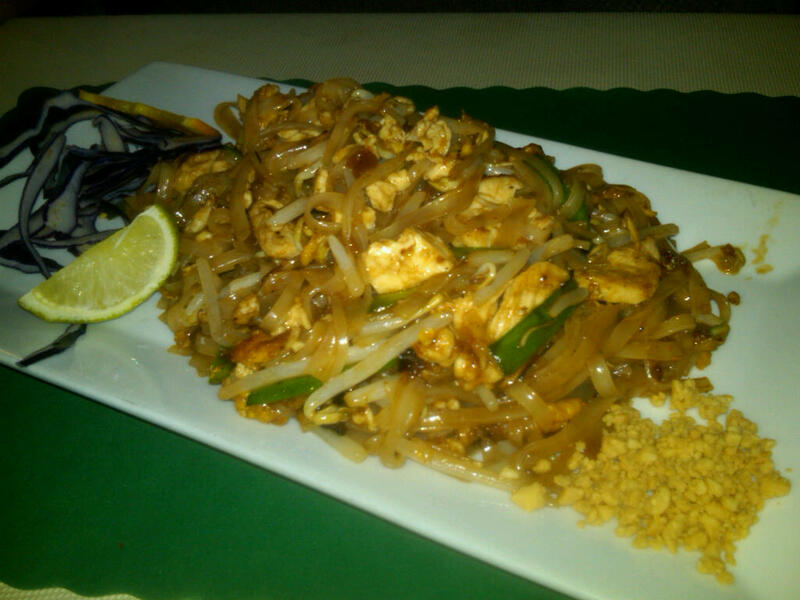 Check out this beautiful pad thai! Take an extra close look at the flurry of peanuts on the bottom right corner. That’s what I’m talking about! I was actually so busy dealing with my dish that I didn’t grab a taste of Michael’s but I trust his report (and empty plate) that it was great. My red curry was listed as one star on their three star scale of spiciness. I don’t know if the chef had a heavy hand that day or if the star system (one star is mild with a little bite) is a bit skewed but holy hell, that dish was spicy! The dish came swimming with yummy veggies like Japanese eggplant, zucchini, string beans. carrots, onions and peppers along with tofu–but not too much tofu, which worked perfectly for me. This dish was packed with flavor and heartiness but each bite was quite fiery! I am so glad you put this up! I LOVE Thai food and I’ve always wanted to go into this restaurant but I never had the guts to risk the taste and quality of the food. But the veggie dumplings look really good and the red curry meal looks TO DIE FOR! I will definitely be going to this restaurant.